DJI, purveyor of premium-brand drones to the poor and the gentry, has a new app on the Play Store. It's a companion app for the recent entries in the company's lineup, mostly focused on the built-in still and video cameras. The app has a livestreaming function (but not remote control) and editing built in. But something odd is going on here: why is version four of the GO app getting a separate listing on the Play Store, despite the fact that both of them are free? The older app mentions support for Inspire, Phantom, and Matrice 100 drones, while the new one drops the Matrice in favor of the Mavic Pro. The updated app has a redesigned homescreen, "near real-time" transmission of HD images and video to phone storage, the ability to adjust camera settings mid-flight, and an updated player and editor interface. There's also a selection of new templates and license-free music in the Editor view, plus flight and telemetry data recording. 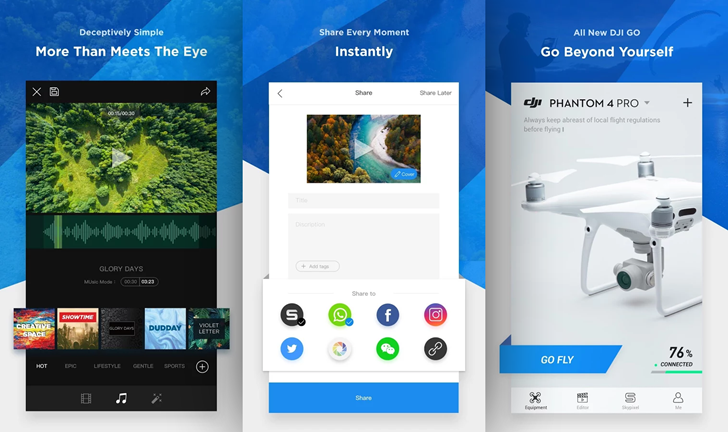 Assuming your phone is the main interactive element of your drone piloting experience, you definitely want the newer version of the app if you can make use of it. Even so, initial reactions from DJI customers seem tepid. The new app is sitting in the Play Store with a 3.9 rating after a handful of reviews, only marginally better than the original's 3.7 score. Our own Artem Russakovskii complains of missing videos in the sync function. The app is compatible with phones and tablets running Android 4.4 and above.